Access to and use of this Website and the products through this Website are subject to the following terms, conditions and notices. By using the Website, you are agreeing to all of these terms, conditions and notices without modification. Colony Hotel may at any time revise the terms and conditions herein by updating this page. You are bound by any such revisions and should therefore periodically visit this page to review the then-current terms and conditions. Everything you see or read on the Website is copyrighted unless otherwise noted and may not be used except as provided for in these terms and conditions or in the text of the Website without the express permission of Colony Hotel. Your use of and browsing the Website are at your own risk. Neither Colony Hotel nor any other party involved in creating, producing or delivering the Website is liable for any direct, incidental, consequential, indirect or punitive damages arising out of your access to or use of the Website. Without limitation, everything on the Website is provided to you ‘AS IS’ without warranty of any kind, either expressed or implied, including but not limited to the implied warranties of merchantability, fitness for a particular purpose or non-infringement. Images of people or items and places displayed on this Website are either the property of or used with permission by Colony Hotel. The use of these images by you, or anyone authorized by you, IS STRICTLY PROHIBITED unless specifically permitted by these terms and conditions or specific permission provided elsewhere on the Website. Any unauthorized use of the images may violate copyright laws, trademark laws, the laws of privacy and publicity, and communications regulations and statutes. In some areas of Colony Hotel, we ask you to provide information by filling out and submitting an online form. We ask for your name, address and contact information so we can contact you to discuss your needs. We do not share any other information with third parties, except in the case of contact or order information needed to fulfill your order. After contacting Colony Hotel via our site, you will receive an email confirmation. We do not sell or share email addresses with other companies. We do use email as a means of receiving feedback from our customers, and we encourage you to contact us with your questions or comments. We read every email we receive. 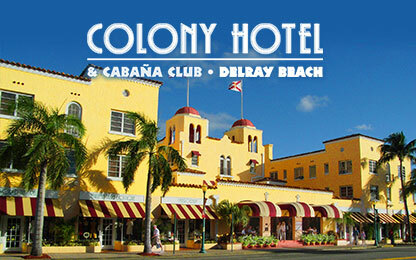 Colony Hotel is a website directed to the general public. We do not knowingly collect information from children under 13.